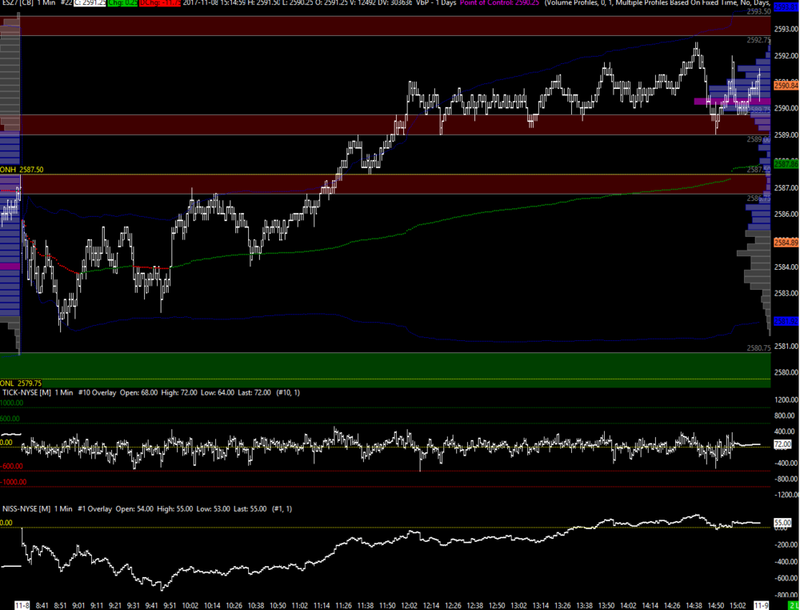 Weakness in the Russell was weighing on the ES in the morning but it failed to test the prior day's low. Once back above the prior day mid, buyers dominated a formed a double distribution closing near the high. Overnight in Asian time there was a push to new highs but this was a failed breakout. There has been a push down to test the low of the week at 75.50 which has so far seen responsive buyers step in. The range so far is 2594.50-75.50. At the moment this just looks like an other side of range test after a failed breakout. The market has been in a balanced state this week and until we see aggression below this weeks low I'd expect a buy response to push prices back towards value. However, there'll be more overhead resistance to expect on a move back up. Holding below 75.50 puts the month's low at 62.25 into focus as the next range extreme, where a buy response would be expected on first test.